One of three commissions produced during the museumaker Pas de deux project, in collaboration with Lin Cheung. This piece was made for 21 people who lived in the Middlesbrough area. During the initial museumaker workshops, participants were so enthusiastic and positive about the ideas and techniques that we decided to produce new pieces for everyone who took part: a kind of “Collective Commission” for local residents. During the workshops each person carved a piece of cuttlefish as one side of a mould for pouring molten pewter. The other side of the mould was formed with a piece of wood. Lin and I recast the original pewter objects with the cuttlefish moulds against oval sycamore plaques. 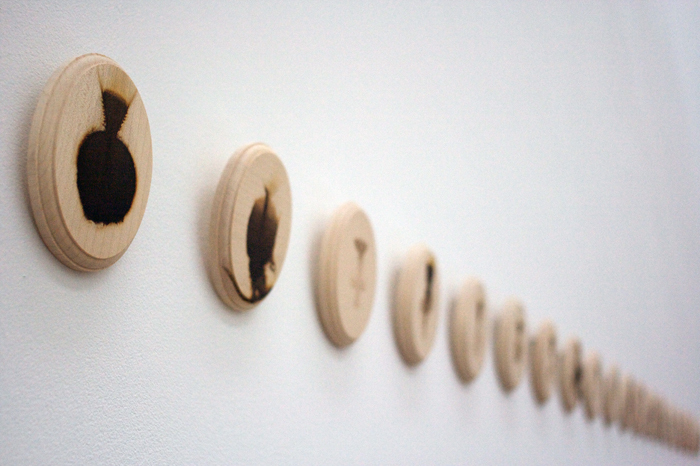 This process produced a collection of 21 replica pendants and 21 scorched sycamore plaques (incidental pyrography). The sycamore plaques were numbered and given back to the participants to live alongside their original pewter casts. The 21 new pendants are replicas of the original casts made by the participants during the workshop. The participants and The Museum therefore have the same primary objects. As a collective 'object' for The Museum however, we wanted to connect the 21 re-cast pieces directly to each other, and to Middlesbrough as a location. We therefore decided to paint them all blue – the exact shade used on the Middlesbrough Transporter Bridge – and give them the same ‘fixings’ as pendants. There is a myth that the Transporter Bridge has one solid gold rivet, and likewise one of the pendants has a secret gold fixing. When displayed as a group of pendants, the forms are turned over so that what was originally the back is now the front. This is intended to reflect the shift in context, from personal memento to public artefact.